As his Russian scandal continues to close in on him less than two weeks into his White House tenure, Donald Trump appears to no longer even be trying to cover up his beholden nature to the Russian government. For instance today he lifted sanctions against Russia’s FSB spy agency which rigged the election for him to begin with. But it turns out Trump’s own people in the White House are going to great lengths to try to hide evidence of Trump’s allegiance to Vladimir Putin — and those lengths are already looking Nixonian in nature. Phone calls between the United States president and foreign heads of state are typically recorded by the White House. But when it came to Donald Trump’s scheduled phone call with Putin last week, his White House opted not to release a transcript of the call in question — instead putting out a brief statement generic characterizing it. So if the call was recorded as per custom, it means the White House is now trying to bury that recording so the public can’t get a whiff of what transpired. But at least one foreign policy expert is theorizing that the White House may have simply turned off the recording devices during the Trump-Puting phone call, while presumably leaving it turned on for the other four diplomatic calls Trump made to foreign leaders that day. Either way, Trump’s people killed the recording by either not recording it to begin with, or by subsequently suppressing the recording. But it turns out this plan was foiled by – you guessed it – the bragging Russians. Russia, which is seemingly very proud of the control it has over Donald Trump, and is willing to flaunt that control at will, released a supposed transcript of the entire Trump-Puting phone call. Can the Russian transcript to be trusted to be accurate? There’s no way of knowing, because Trump’s White House killed its own recording. 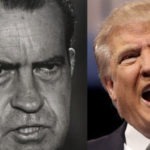 The last U.S. president who tried to bury a scandal in a manner which involved missing tapes was Richard Nixon — suggesting that Trump is already entering Watergate 2.0 territory after just two weeks.